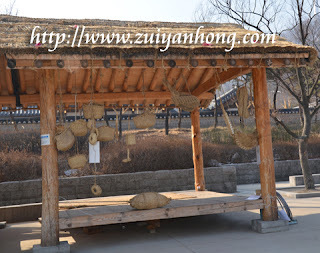 This is an arbor which is built in Namsangol Hanok Village. You should be familiar with this arbor if you are from farm village. Perhaps the structures of the arbors are not alike. Korean farmers rest and take lunch at the arbor at noon. The harvested crops are placed at the arbor and later transfer to the collection center. 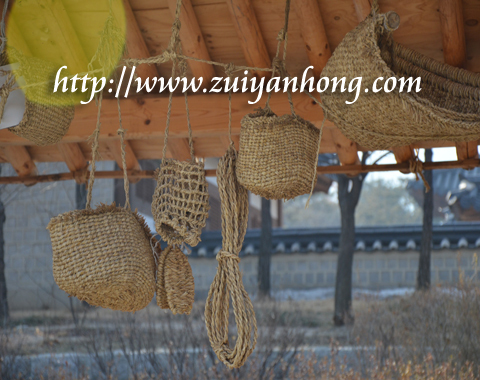 There are many handmade containers hanging on the wooden beam. These containers are made with hemp rope. Now the hemp rope has vanished in Malaysia. To my surprise I saw these hemp rope containers in Seoul.